There are better seven-passenger family vehicles for sale, but few below $30,000 with sliding side doors. We’d choose a Transit Connect over the doddering Dodge Grand Caravan, if we had to make that choice. The 2019 Ford Transit Connect gains better safety and fuel economy, but it’s still just a marginal player among family-ready utility vehicles. The 2019 Ford Transit Connect gains critical new safety features, new infotainment, and a new powertrain. Despite the gains, it’s much better suited as a utility vehicle for small businesses than it is as a family-mover, though it’s a reasonable alternative to many crossover SUVs that cost as much and offer much less in the way of interior space and seats. Ford sells the 2019 Transit Connect in XL, XLT, and Titanium trims, starting at about $28,000. In any of them, its tall-box shape looks more flower-delivery van, or plumber wagon, than it does family vehicle. For those of us guilty of admiring its bare utilitarian looks, it’s maybe a perfect 10. For most, its appeal rests more in its exceptional passenger space. Up to seven passengers fit in a Transit Connect, provided it’s a long-wheelbase model. Its bucket seats suit a wide range of body types, and in any of them, fold-flat seats open up vast cargo expanses that outpoint most compact crossovers. It’s a bit narrow but overhead space soars, and the 2019 Transit Connect can swap middle-row buckets for a three-person bench, all trimmed in leather. That space implies the ability to haul lots of people and cargo, and the available tow package promises the ability to pull a couple of thousand pounds. The Transit Connect’s new 150-horsepower inline-4 and 8-speed automatic should have had a say before those promises were made. Acceleration is just adequate when the Connect’s not laden to the gills; fill it with suitcases and teenagers, and it will struggle to merge or pass. The Transit Connect rides fairly well, but its steering gets special mention for its direct feel and highway tracking. Ford puts forward-collision warnings and automatic emergency braking in every 2019 Transit Connect, and makes blind-spot monitors, adaptive cruise control, and parking sensors widely available—but neither the NHTSA nor the IIHS has crash tested one. Base Transit Connects lack power side mirrors and have vinyl seats, for obvious work-duty reasons. The XLT Wagon hits a sweet spot with touchscreen infotainment, Apple CarPlay and Android Auto compatibility, cloth seats, and options for leather upholstery and a choice of middle-row seats. 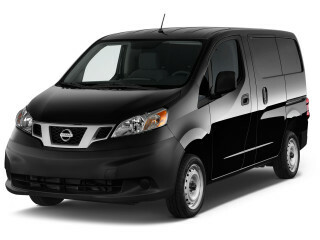 Spend into Titanium territory and any mainstream minivan makes for a much stronger buy, but the inexpensive Transit Connect provides an interesting alternative to bargain-basement, outdated crossovers and minivans—especially for drivers who need to blend work and play on a daily basis. Fans of boxy wagons will love the Transit Connect, while others simply ignore it. We would say it’s tough to style a van into a fashionable piece, but that’s easily refuted by the high styling scores we give the Chrysler Pacifica. Ford could do better by the Transit Connect if it weren’t a cargo/commercial vehicle first, passenger wagon second. It doesn’t need to. The prosaic shape puts function far ahead of form, without the flair of a Honda Element, but it still looks fine. It’s easy to get along with; most passers-by barely notice it, and register it simply as another work van. The few who seek it out for its cross-functional appeal won’t mind its tall headlights and side glass, or the multiple roof pillars that make it appear taller than it already is. The interior’s a bit less easy to explain away. It has a modern design sense in its sculpted forms, but since it’s also drawn from compact-car roots, some of those forms cut into the function. The gauges are a particular nuisance; they cant downward toward the driver’s feet in the Transit Connect. They’d be in sight if the driver sat a foot lower, as they might in a related Ford Escape. The overall look still would fit in perfectly in a Focus or Fiesta, if those vehicles still were on sale in the U.S. The crowds of buttons work well enough, and the materials don’t detract from the cabin’s purposeful appearance. A new powertrain propels the Transit Connect adequately, but handling’s a bigger plus. 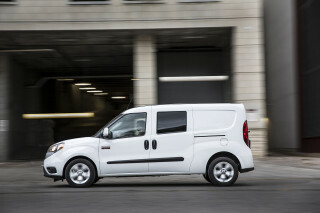 The Ford Transit Connect drives less like a commercial vehicle than it does like a compact car. The explanation’s simple: It’s a long-lost cousin of the now-discontinued Ford Focus as well as the Ford Escape, and a quick drive confirms the link. This year, the Transit Connect adopts a new drivetrain in passenger Wagon versions. While a turbodiesel has been delayed until 2020, and a 2.5-liter inline-4 sells only to fleet buyers, drivers who buy passenger TC Wagons get a 2.0-liter inline-4 paired to an 8-speed automatic. Every one of its 150 hp goes to the front wheels, and given the Connect’s weight of about 4,000 pounds, acceleration is tepid in the best of circumstances. With two passengers aboard it keeps up with moderate highway traffic; more passengers or cargo pitch mean longer passing and merging times. The 8-speed automatic shifts unobtrusively, and extracts all it can from the non-turbo engine. Ford’s adapted the independent front and torsion-beam rear suspension from its compact-car family, which earned plenty of kudos for nimble handling. The Transit Connect has some of that verve in its naturally weighted steering, easy highway tracking, and generally responsive handling. Its sheer ride height means cornering should be low on the priority list, even without a full cargo or passenger load. It’s still among the most pleasant vans we’ve driven, nicer to drive even than the most prosaic crossover SUVs with diamond stars on their noses. Tow ratings of up to 2,000 pounds come with an available kit; keep in mind any pulled trailers will further depress acceleration. The Transit Connect won’t be mistaken for a luxury vehicle in any way, but it’s practical beyond reproach. The Transit Connect’s roots in commercial vehicles make for an excellent box in which to bring your crew and their baggage. It’s by no means the most plush, isolated, or luxuriantly trimmed vehicle plying the highway, but the 2019 Transit Connect excels in space. The Transit Connect could get away with more flimsy seats, but we’ve driven cargo and passenger models and found its front buckets supportive and comfortable. They sit high in the vehicle, and the low placement of the gauges is an issue for tall drivers, but head and leg room are unequivocally not a problem. More expensive vans get leather upholstery and power driver seat adjustment, and front seats can have manual lumbar adjustment, too. The second row can be a three-passenger bench or bucket seats. Given the Transit Connect’s high roof and sliding side doors, it’s easy to clamber into the rear seats. The bench doesn’t have much in the way of support, though it’s big enough to accommodate two adults. Three large across in the second row will remind drivers the Transit Connect is more narrow than a minivan. Second-row buckets are fitted in the least and most expensive Transit Connects. The seats fold forward on two points to make third-row entry and exit easy. The third-row seats slide on a track to flex cargo space and leg room, and they fold flat to accept more cargo, but they don’t tuck into the floor as all modern-day minivan third-row seats do. The interior of the passenger wagon is by no means quiet, but the acceptable level of noise from the tires and the inline-4 engine don’t resonate inside as they do in commercial versions without rear seats or sound deadening. Fit and finish are fine for the intended use, but there’s plenty of hard plastic trim and rubber-lined floor material—exactly as it should be for a work-ready van. The 2019 Transit Connect hasn’t been rated for safety. We do note this year that the Transit Connect now comes standard with automatic emergency braking, a major improvement. It also can be ordered with blind-spot mirrors, adaptive cruise control, and active lane control. Outward vision is a strength in passenger versions, thanks to lots of tall windows and a high driving position. The barn-door tailgate doesn’t help, but passenger versions with the top-hinged tailgate don’t suffer the split-window syndrome. We’ll update this page if the van undergoes crash tests. The 2019 Transit Connect drives best in XLT trim. 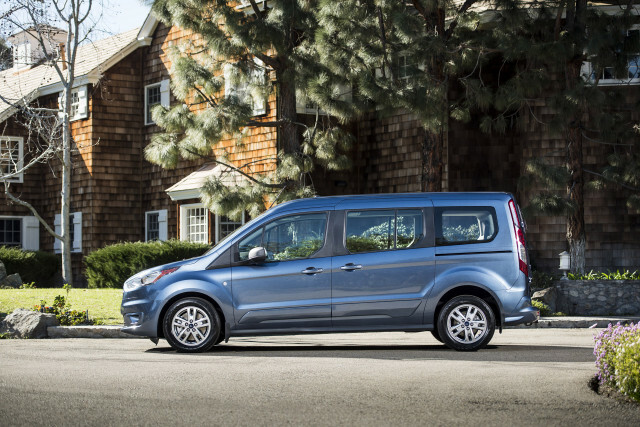 The 2019 Ford Transit Connect comes in XL, XLT, or Titanium trim, as a six- or seven-passenger wagon. Commercial versions can have as many seats, or as few as 2, in addition to a short-wheelbase body. The $28,140 Transit Connect XL Passenger Wagon skips a few key features. It has power windows and locks, cruise control, automatic climate control, keyless entry, an AM/FM audio system with Bluetooth and a 4.2-inch display screen, 16-inch wheels, a top-hinged tailgate, and vinyl upholstery. It also comes with automatic emergency braking and two bucket seats in each row. It has a small infotainment screen, and touches such as power mirrors and cloth seats cost extra. Options include automatic headlights, active lane control, blind-spot monitors, front and rear parking sensors, power mirrors, cloth seats, roof rails, a second-row bench seat, a tow package, wireless smartphone charging, and upgraded infotainment that includes a 6.5-inch touchscreen, navigation, and Apple CarPlay/Android Auto compatibility. We’d spend up to the $29,775 XLT wagon, which adds the touchscreen infotainment system (but not navigation), reverse parking sensors, rear-seat climate control, wireless smartphone charging, a second-row bench seat for a total of seven passenger seats, and a power-adjustable driver seat. Leather upholstery is an option, as are blind-spot monitors, remote start, and active lane control. Go crazy with the $32,890 Titanium wagon and you’ll get leather upholstery, heated front seats, keyless ignition, and six-passenger seating. You’ll still pay more for a panoramic roof, remote start, a quick-clear windshield, and a tow package. The Ford Transit Connect’s gas mileage outscores many crossovers in fuel economy. While many crossover SUVs struggle to hit EPA combined numbers in the mid-20-mpg range, the Ford Transit Connect tops out higher, thanks to this year’s new powertrain. The EPA rates the 2019 Transit Connect Wagon at 24 mpg city, 29 highway, 26 combined. It’s a significant improvement from 2018’s ratings, thanks to a new engine and 8-speed automatic, and stop/start. Ford’s promised a turbodiesel will become available in the Transit Connect in 2019, but hasn’t hasn’t confirmed when. Gas mileage drops for the commercial versions of the van; they’re sold with a slightly larger-displacement inline-4.